Queens, NY (January 30, 2018) - On January 30, hundreds of youth from across New York stormed the halls of the State’s Capitol Building for United Neighborhood House's 18th annual Youth Action Day, where youth spoke about the importance of the Summer Youth Employment Program (SYEP) in their lives. Groups attended a morning rally, then proceeded to back-to-back meetings with elected officials. SYEP is a statewide program that funds summer jobs for youth between the ages of 14 and 20. In New York City, state funds supplement City, federal, and private funds for a program that is open for 14- to 24-year-olds. Advocates asked for a $4 million increase in the SYEP budget to make up for the rise in minimum wage. Eleven-year-old Catharine Vergara was among the 300 young people to travel to Albany that day. She arrived by bus with the Queens Community House (QCH), an organization that operates the Beacon afterschool program she attends daily. Catharine is an active Youth Council member in the program and helped organize the trip. “I am proud that we made it this far,” she said at the beginning of the day. “I just hope we get to meet with everyone on our list.” But a busy day in the Capitol Building proved a disappointment for Catharine. Her group was met with warmth, but not a single elected official was available. 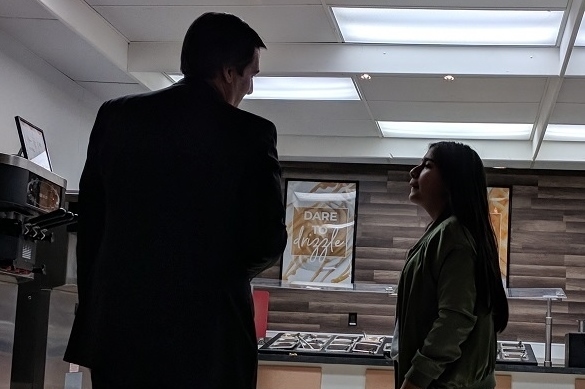 As the afternoon drew to a close, the group stopped for frozen yogurt and Catharine saw Queens Senator Michael Gianaris filling a cup with chocolate soft serve. She approached the Senator and politely asked if she could speak with him about the SYEP Program. He lent an ear while adding his toppings and asked for materials to take home. Grinning from ear to ear, Catharine thanked the Senator and rejoined her group. About Queens Community House: Founded in 1975, Queens Community House, is a multi-site nonprofit organization that offers a wide network of comprehensive services to individuals, families, and communities throughout Queens. From 29 sites in 14 diverse neighborhoods, QCH helps thousands of Queens residents to thrive in school, make healthy life choices, succeed in educating themselves, become engaged citizens, stabilize their housing situations, and make the most of their senior years. Learn more at www.qchnyc.org.